How do you get students to read for pleasure? Home/reading/How do you get students to read for pleasure? For most people, this is uncontroversial. We talk a lot about the power of books and the need to get more children to read for pleasure. But how do you get students to read for pleasure? I have no idea. Neither does anyone else, not really. This is an endemic conundrum which troubles all teachers and parents. But it’s a bit of an odd question when you think of it: how do you make someone enjoy something they don’t enjoy? There are lots of expensive ‘solutions’ out there, all trying to give students some sort of reward for the time invested in reading books. These solutions are great at producing graphs showing how much reading is being done but they’re hopeless at showing whether someone is enjoying reading. Maybe we’re asking the wrong question? If we have no control over what students enjoy, we do at least have some control over how frenquently they engage in different activities in schools. Maybe the question we should be asking is, how do we get students reading every day? In a packed timetable, his is still difficult for schools to deal with, but it’s a lot better than asking how we can make them enjoy reading. So, how long should we get them reading for? Does the length of time they spend every day with a book matter? The argument is that although ‘just reading’ can appear inefficient, many more words are learned through ‘natural’ reading than through explicit vocabulary instruction. My view is that vocabulary instruction is important, but so is reading books. It shouldn’t really be an either/or proposition, but if you’re only able to do one, maybe 25 minutes a day of reading will result in more vocabulary learnt as well as the potential for enriching students’ cultural capital through finding out more about the world. So now our question becomes, Ho do you get students to read for 20-25 minutes a day? This hard but now we’re on to something measurable. 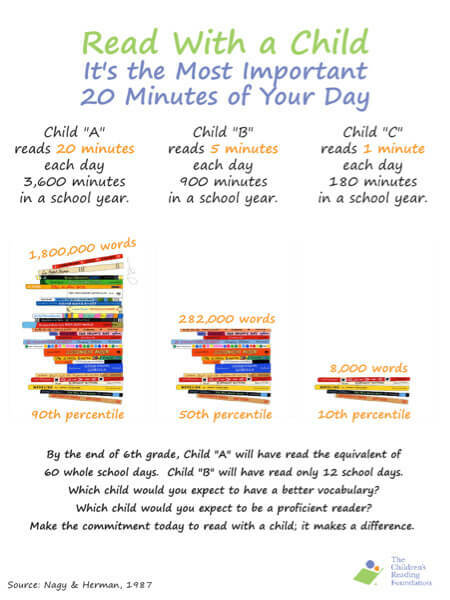 We can use this as a yardstick to see how we’re doing: are we managing to get children to read every day? Are we managing to set aside 25 minutes a day? The answer might be ‘no’, but at least you know what you have to do to improve. A number of schools have opted for a Drop Everything And Read (DEAR) approach. Like many school programmes deigned to make children enjoy reading, this can backfire. Sitting in silence and reading at the drop of hat might be fine for people who already enjoy reading but it’s not so great for those who’ve learned that reading is boring and difficult. There’s always a group of children who spend most of the time looking for a book and then hold it upside down while teachers scurry round being the reading police. This is unlikely to foster a love a reading. But, many years experience of teaching unruly children has taught me that when all else fails, reading aloud is the one thing that’ll pacify them; we all seem to love being read to. Now obviously this doesn’t have all the advantages of the type of decoding practice Stanovich was discussing in the opening video – he’s absolutely right about the need for fluent, automatic decoding skills – but it does get children to enjoy a good story. So, here’s my idea: instead of trying to make children enjoy reading by making them read independently, why not read to them instead? Decide on a rolling programme of reading slots to occur at different times over the timetable. So, for instance, on week one you could stipulate that that DEAR has to take place Monday P1, Tuesday P2, Wednesday P3, Thurs P4 and Friday P5. Then on week two the pattern might be Monday P2, Tuesday P3, Wednesday P4 etc. In this way curriculum time is not being taken from the same lessons week in, week out and resentments are minimised. Choose a book and buy a copy for all members of staff. In one school I worked with the book chosen was Treasure Island. The thinking was that this was a text with high cultural capital but would be likely considered too difficult or irrelevant for children to choose to read independently. You choice doesn’t have to follow the same logic but in a secondary school spanning students aged between 11-16 this was deemed appropriate for all. Break the book into 25-minute sections and let teachers know each day how much they are expected to read (e.g. pages 19-27) and every day everyone in the school will be reading the next installment of the story. There’s a lot more you could choose to do if you felt it appropriate – you could point out key vocabulary to share with students or suggest a few comprehension questions – but I think just reading is a good starting point. Students aren’t interested in the book. This was a big problem with Treasure Island as the story has a pretty slow start. It took a few weeks to generate sufficient interest for students to want to know what happened next. Top tip: consider the choice of text very carefully, but don’t be scared by ‘hard’ reads. Some members of staff can’t be bothered to read. For the first few weeks, some teachers couldn’t see the point and found excuses for not dropping everything to read the next section of the story. Initially, students weren’t that bothered either, but as the story gained momentum and it became clear that most staff were reading, students began to complain and demand that they got their reading fix. This pretty much policed itself very rapidly. Some students bought copies of the book, read and ahead and spoilt the story for others. I really couldn’t see this as a problem – in my mind this was job done – but it’s amazing how seriously we treat these things. It’s important to remember that we’re trying to get children to enjoy reading, not punish them for their enthusiasm. Over the course of about six months or so, every student in the school experienced having a classic book read to them and, almost universally, they really enjoyed it. It’s not a panacea, and it’s certainly not a replacement for teaching students how to read fluently and accurately, but does help give them the knowledge that reading can be enjoyable when it’s give such prestige within the school community. So, what do you think? Worth a try? I’d be really interested in hearing from anyone who’s tried something similar or is interested in giving this a go. Have you heard of the following? http://schools.fictionexpress.co.uk/blog/ It involves reading chapters week by week and pupils can vote on the plot. I think your idea is a good one but as always there needs to be some flexibility as inevitably some pupils/cohorts will respond better to different methods. Another was is through Bug Club but the problem is access to the internet – at least it includes children’s authors that are well known and a range of different text types. I think the nut to crack might be not physical books but online ones and how everyone can get hold of these. That way it is possible to track and intervene those who read least and find ways to encourage them. However, I do think that to some extent we need to accept that there will always be people who do not enjoy reading books, just as there are people who do not enjoy eating strawberries,etc. In which case I would take them reading because it has to be done. You should hopefully see the benefits of phonics teaching in secondary – the more widespread it has become the less likely you are to have children who struggle to decode words so more challenging texts will not be a problem at that level. It would also be worth considering – do the children have an understanding of the cultures and history being referred to? If not, then going through that first might be of benefit so they can access the texts more easily. I had a reading group recently who misunderstood a comment made by a character who was Native American as they didn’t know about the way they name in their culture. They thought the character was being cruel when in fact he was doing nothing of the sort!! I think you could project classics taken from the internet for free and pupils could listen or read along. It’s possible sort of in my school although I only have 15 minutes each day at my disposal. Perhaps classic short stories are more feasible. I’m very interested in doing a bit of research on this. Research would be interesting, but what would you use to measure impact? How would you introduce sufficient controls? Worth trying though? Well we do a standardised reading test every September anyway, so I would repeat that test in March I think. I’m thinking Y9 as I feel that will eliminate confidence/nerves issues. We use the Suffolk reading scale which is as much a vocabulary test as anything. I will have to think about controls. In my experience any school wide reading scheme can be very, very dependent on the way it is implemented. I think it is worth trying though. I don’t actually think there is enough solid research on reading. Very pleased to see that you mention the problems of DEAR for struggling (and disinterested) readers. Well-meaning teachers are often not aware of how torturous it can be for these students. I really like your idea and also the fact that it’s easy to implement. It is interesting that children will listen for pleasure when they are less willing to read themselves. I think it is easy to underestimate how unattractive it must be to do an activity you find extremely effortful. I have tried picturing being told I really should read Das Kapital and similar every day and simultaneously be told that if only I can adopt the right attitude I should find this fun. Perhaps if I was in a prison cell with no other distractions I might get there but children have countless other more instant forms of pleasure. This is why I am obsessed with phonics. It does not directly solve the vocabulary deficit but it does ensure lifting words off the page is much less effortful which means children are more likely to experience the Matthew Effect. Anyway I’m not an Englush teacher but I really like your idea! Sounds broadly similar (though more thought through) to what I will try next year. Have always had a very structured tutor time for my group with a different activity every day. I had discussion with them about the structure for next year and many said they’d prefer that I read to them instead of our weekly silent reading. I’m going to run with this, and hopefully get a few other groups on board. With 5 year groups, 8 tutor groups per year, and 42 unused copies of ‘A Christmas Carol’ in the cupboard it seems like a no brainier to me! You are spot on about phonics – ignore the detractors – the vast majority of children learn to read and write (albeit phonetically). There are small number who don’t but these are SEN. I have never come across a child with no learning issues who is able to learn and then use phonics. All other approaches are simply not as effective or give children the same confidence to read. The importance of phonics is that it provides students with the ability to decode fluently without which their reading speed will likely be insufficient for them to comprehend text, no matter their understanding of individual words. Attempting to force kids to enjoy something is silly. Lecturing that something is good for kids doesn’t help. Pretty much everyone knows this, and yet we persevere. Sorry seems I managed to cut of the rest of my original reply! It was along the lines that yes there is sense in doing something measurable, but that there should also remain an emphasis on inspiring a love of literacy, but it should be in the broadest sense ie. writing, sharing stories aloud etc. etc. not only on reading – and emphasis on inspiring, not forced pleasure. 1. The consequences of reading for pleasure can’t be reduced to ‘vocabulary’. In fact, ‘vocabulary’ is not how language works nor how we process it. We understand and use language in sequences of words, that are held together by grammar. In order to be able to read – in the full sense of the word – we have to ‘get’ these sequences and sequencing systems and patterns. Reading for pleasure – genuinely choosing what we want to read and reading it – is a great way to get those sequences into our heads. 2. A crucial part of reading for pleasure is ‘browsing’ – that is, scanning and selecting. It appears to be extrinsic to ‘real’ reading and yet it is a vital capability to have in order to process the learning experience offered by schools. Children, students and adults who can browse find that they can do a lot of different kinds of work in relation to school-type work. Quite often, the browsing is part of categorising, ‘setting’ and classifying. 3. A real programme for reading for pleasure won’t work if it is confined to what goes in school time. We have to think of how to enable schools and parents and students work together on this. Otherwise what happens is the the process never reaches the unreached. In other words, it merely confirms those who are often reading for pleasure anyway. I suggest that in order for those partnerships to work, this requires thinking about organisationally – in terms of parents and students being involved in coming up with plans, suggestions, etc. This may therefore require the dreaded ‘committee’ process – somehow. 4. There are already a variety of charities which spend a good deal of their energy figuring out how to sponsor and encourage reading for pleasure and have packs and vast amounts of research to back it up. There are also many schools which have pioneered successful programmes. The charities include, Booktrust, Literacy Trust, UKLA, the Reading Agency, and in London, the Evening Standard’s campaign and so on. 5. A key piece of research across 27 countries over 20 years involving tens of thousands of school students, and research that factored out the parents’ education and profession was Mariah Carey’s work at the UNiversity of Nevada. 6. In the 1950s, many of us learned to read using the Beacon Readers. The teachers’ booklet that backed this up, made very clear and in great detail how teachers should neither do purely phonics, nor do purely non-phonics but should teach initial reading using both methods at the same time. Some people in the present context have approached the use of phonics with the slogan ‘first, fast and only’. The present Schools Minister confined on a panel I sat with him on, that to do otherwise is ‘confusing’. Some school managements have interpreted ‘first , fast and only’ as an instruction to remove non-phonically regular texts from reception and Year 1 classrooms. 6. When children are deemed to be ‘not reading’ i.e. being unable to pass the Phonics Screening Check, some teachers are being asked to do more of the same, rather than do anything different, nor to investigate whether there are multiple reasons for a) not passing the phonics screening check or b) finding out whether some children can read pretty well but fail the PSC anyway. Indeed, there is now some evidence to suggest (UKLA) that ironically some ‘middle class’ children how have learned to read at home with their parents using a variety of methods find the PSC confusing. Some have been observed ‘correcting’ the nonsense words, e.g. ‘strom’ to ‘storm’. So they do not pass. 7. There is a government report on the phonics screening check on the gov. site. 1. Of course reading for pleasure cannot be reduced to vocabulary. Only a fool would think so. 2. This ‘browsing’ thing sounds improbable as a ‘crucial’aspect of reading for pleasure but I’m more than happy to read the supporting evidence…? 3. What I suggest in my post is notable for ability ability to reach the unreachable, or have you spotted a flaw? I recommend several ways for schools to work with parents all of which fell outside the scope of this post. 4. Ha! I’ve seen a good bit of this ‘evidence’ and have to say it’s mostly shockingly bad. At very best it’s correlational. If you think I’ve missed something worthwhile please let me have the links. 6. Not sure quite what your point about the PSC is or how it relates to my post. In its favour, the PSC was developed by the TEDS team (headed by Robert Plomin) investigating the behaviour genetics that underpin reading and it’s been found to be a remarkably accurate predictor for GCSE pass rates at 16 and income ant 42. 7. Why are you telling me this? Taking your last comment first: I thought I was contributing to a general discussion about ‘reading for pleasure’ rather than telling you something. As there were some comments above about phonics I appended those to the discussion. It’s ‘Carey’ not ‘Cary’ which may make that piece of research easier to find. If you think the research done by all those bodies I mentioned is crap, you should tell them – or indeed, more urgently, tell the government bodies that throw money at them. They are living with the illusion (delusion?) that they have evidence to back up their work. The matter of browsing is taken mostly from my own observations over many years. I am always aware how dangerous that is but then it is partly the process by which we share ideas and thoughts. I am glad that you think constructive feedback is always appreciated. I’ve found, through long and bitter experience, that no one thanks me for pointing out their research is crap. And crap isn’t really fair – it’s just not worth all that much. I like the NLT surveys: they provide some nice correlational statistics, but because we’re such natural pattern seekers it’s hard to avoid ‘seeing’ the meaning we’re being pointed towards. And there’s always an alternative interpretation! The illusion that we have evidence to support our beliefs is widespread and pernicious. It’s rarely the case that anyone believes what they believe because of evidence. Instead we post hoc select evidence which fits our beliefs. This is done without our being aware of all the biases we routinely bring to bear. If you’re interested, I go into detail about this in my new book. My own experience of ‘browsing’ behaviour is what suggests it might be implausible as a basis for developing children’s pleasure in reading. I find nothing undermines the likelihood that I will commit to reading any one thing than the presence of interesting distractions. On the contrary, my own childhood was characterised by boredom. I’ve never been sporty and we didn’t have a telly. What else was there for me to do than spend time at the local library reading books? Today, I find my tendency to browse the internet means I struggle to focus enough to enjoy something as demanding as sitting down to read a book. But we’re all victims of our own experiences; it’s always hard to step outside of these experiences to see what’s ‘really there’. Following from Michael & David’s conversation I’d say from personal experience and observation that the Freedom to Browse, once a student can basically read, is hugely important. David, based on your ‘Rebel Act’ post it looks likes you fearlessly took this freedom into your own hands. Love it! As a recent student in our ever time-poor school system, without much access to books except those I got from school, I’d picked up the message that appropriate books are to be selected for me and I’m to study them deliberately and carefully. Secretly I felt there was something wrong with me for not liking the selected class books that I could critique so successfully; who am I to pick my own reading if I don’t have taste enough to enjoy these important novels? With this in mind truly ‘browsing’ seemed, to my student-self, like a complete waste of my precious time. Clearly all this is nonsense, I just honestly didn’t know better! Space, time, freedom from judgement to select and even bigger examples of teachers in school (any subject) shamelessly sharing what they’re reading and loving and hating and abandoning is what I’d like to encourage in this little post. Numbering you comments is very helpful. Thank you. I work right now with lots of primary children aged 6-11 who’ve learnt to read using mixed methods at home and at school because mixed methods are still being taught alongside phonics, at least in some primaries. When I say mixed methods, the children read (by sight) what they recognise easily and guess what they don’t based on letter clues. You’re right. They do ‘correct’ strom to storm and other words like this, often. In exactly the way you describe, and for the same reasons, the same children ‘correct’ carry to cry, journey to joy and would to wild. I have a bank of hundreds of very interesting and informative examples. But, of course, for these words, this is not ‘correcting’ at all. The guessed word in each case is a real English word – but it is wrongly read. This is ‘mis-reading’ – just as much a ‘mis-reading’ as storm is of strom. The children do this ‘lookaliking’ reading (for that’s how it seems to me) when reading words in context and when reading them in lists. It’s fascinating and frustrating in equal measure. These children are practised guessers. They guess instinctively from shape and, usually, according to my bank of examples so far, from first, last and a random middle letter. This is exactly what they do in the case of strom. In context, the sentence itself rarely informs the guess, I’ve found. The children often guess a lookalike that makes no sense at all but carry on regardless. Many children I work with do this for a word every sentence or so, sometimes more often, sometimes much more. Parents and teachers can (and do, I’m sure) easily investigate this for themselves, making a simple record of mis-read words and the ‘lookalikes’ from just 5-10 mins of reading aloud. Patterns emerge very quickly which are useful for informing teaching. As many teachers and parents realise, this ‘lookalike’ reading strategy shoots holes in a child’s comprehension. However, the child can often get the overall gist to do well enough to at least talk about main threads – and answer some questions if a test. They can pull this off so well that they can even appear to be a ‘good’ or above average reader, sometimes, therefore, causing no concern at school. It’s the parents in these cases who’ve noticed the problem and who bring their child to me. 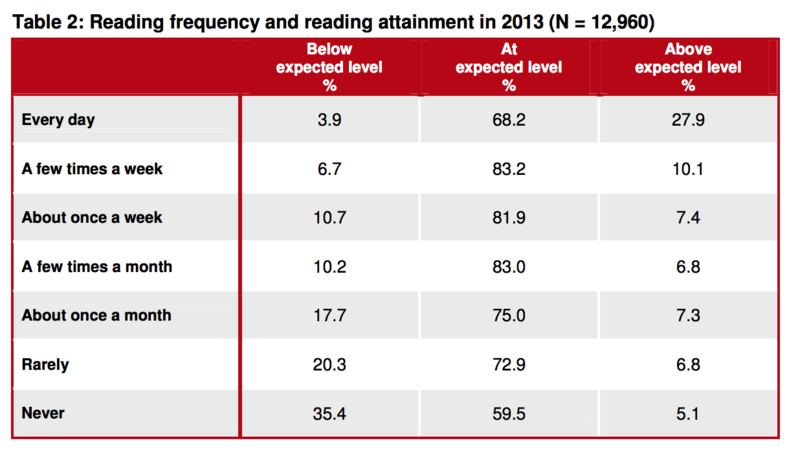 I think these are the very children you are talking about in relation to the Y1 test. But, the words they mis-read, with a quick guess and a lookalike, are often words they know very well and fully comprehend. That’s not right no matter how well they manage, whichever way you look at it. This is not effortless, accurate reading. We can’t let them move on to secondary reading like that, but we do. For these children, our teaching of reading has not equipped them adequately for secondary, where texts will be ever more difficult to read, with fewer pictures on which to rely. Do we want any of our children to read like this, making incorrect guesses for any words they would otherwise know, after seven years at school? I don’t. The students might get by at secondary, understanding enough to cope, and they might eventually self-fix their lookalike reading habit. I think many must, somehow. Perhaps if you do it for 5-6000 hours or so it starts to correct itself in time for GCSEs… or not. But whether they get by or they don’t, whether they are picked up and helped by brilliant teachers, parents or intervention strategies on the way or not (many are, of course), it still can’t be right to teach them to rely on luck and a bit of guesswork to read in the first place. No matter how lovingly and enthusiastically we do it. It’s a very odd strategy to deliberately encourage in our youngest, most impresionable pupils, given the flawed outcomes. The only teaching solution for those already addicted to lookalike reading is to unpick the guessing habit and to teach children to read seemingly unfamiliar words by their letters, from left to right, accurately. (That’s what I spend my time doing now, teaching children to unlearn the habits that hinder their reading.) This may slow them down at first but speeds them up soon after if taught and practised thoroughly. But it’s not easy! It would be much easier and more positive for all if, for those still early in the system and those just starting out, we unite, professionals and parents alike, in teaching children to read, with precision, what they actually see on the page, not what they think they see. Then they’ll be better equipped to read strom as the word it really is – alien, muggle, hobbit, wookiee, lilliputian, oompa-loompa or not. Primary teachers do this already, every day. It’s called ‘story time’. It’s really good. I’m sure it is. It disappears in secondary schools though. I have been in secondary schools where the age-equivalent thing takes place: whether that’s from English teachers, librarians, book clubs or indeed writers’ visits. I’m not sure ‘disappears’ is a fair picture of everywhere. It is for ‘some’ and perhaps ‘many’ but not ‘all’. You’re right – ‘disappears’ is a generalisation. Of course there are islands of good practice but I rarely seen any in the hundreds of secondary schools I visit. Where I do see book clubs and writers’ visits, these tend to be rather shallow experiences that only tend to have an impact on children who already enjoy and value reading. Book clubs are elective and writers’ are short term. A good library and librarian can make a huge difference but all too often librarians are redesignated ‘learning resource managers’ or some such and end up as a mix between glorified reprographics technicians and IT assistants responsible mainly for printing out Accelerated Reader reports. Comments should have a like button! I was going to write the same. Three cheers for reading to children. (Though this does rather remind me of when I first read Dylan Wiliam coming up with the revelation that if you put a ‘mark’ for a piece of work it didn’t help children and that a helpful comment was of more use.) If you want to raise the standards in reading in a secondary school, then read quality class novels that grip them, teach comprehension and writing through these, and hear them read every day. In one key stage 3, we have not only improved reading in this way but also have radically improved the progress in children’s writing from the dire situation 2 years ago. To do all of this, the school had to be disturbed into realising what an appalling job they were doing – this was quite easy. We showed the year 7 teachers some year 6 books. Phonics – the government’s own recent evaluation says that the phonic emphasis in primary has not improved literacy. In the same way, the new emphasis on grammar will not help either 0- because both have been in isolation – phones for a test and grammar for a test rather than grammar for writing/ phonics for spelling – that might have helped. My guess is those involved will blame the teachers for not doing it properly… anyway, three cheers for reading to children. Could you give me a reference for the evaluation you are referring to, because I have not seen it? Unless you are referring to the recently published evaluation of the phonics CHECK, which concluded that no evidence had been gathered that could conclusively show that the phonics CHECK had improved reading (which is, however, quite different from saying that it had not done so). Note that this gradual rise began with the cohort who were in reception for the academic year 2007-08, that is, the first year that phonics teaching was introduced. …which should be put alongside Charles Hulme’s research with Year 4s showing that group A working with just phonics scored significantly less well than group B working with the York approach to comprehension. No one argues that children should work with “just phonics”, except as a method of word attack to lift the word off the page. Comprehension is just as important as decoding. This is acknowledged by all phonics advocates and is the current consensus of reading scientists. Hi Pie, could you give some specific examples of the things that you did with the year 7 teachers to help them realise that they had areas they needed to improve and the strategies you used to help them improve students’ progress? So, I’m not sure about the ‘no one’ here. Perhaps Debbie can fill us in on whether it’s ‘no one’ or ‘very few’, ‘some’ or what exactly??? Actually, the ‘only’ bit is simple. Early in the process, when asking children to practice their understanding and recognition of the English alphabetic code, ‘only’ use texts which are matched to their capabilities in order to maximise success. Asking them to practise their recognition of the code with texts containing code at a level they haven’t yet been taught would maximise the possibility of difficulties, not success. Simultaneously, ensure that children ‘only’ decode (not guess) when practising their understanding of the English alphabetic code. Obviously, allowing or encouraging children to guess whole words would undermine the act of learning the alphabetic code so that would be confusing, non-strategic and pointless. If they recognise a word instantly and read it without decoding it out loud, that’s part of the process. It doesn’t need to be forced, though, because it happens naturally as code recognition becomes automatic. Discourage guessing which will quickly reveal itself through errors. If a child reads ‘cry’ instead of ‘carry’ or ‘went’ instead of ‘wet’ they are guessing from word shape and using only fragments of code. If you have spent time teaching phonics, why would you then deliberately teach children not to apply the knowledge you’ve taught? That’s self-defeating and a waste of precious teaching time. Surely that is uncontroversial too. That’s it in a nutshell. That’s ‘only’ explained for you. The next bit leads us on to reading for pleasure. None of the above excludes reading anything at all for pleasure with and to children whenever a willing adult is available to help and no one would suggest that a child should be discouraged from looking at any book that’s caught their eye. Phonics enthusiasts, as you like to call them, are just as passionate about reading for pleasure as you are. To the phonics enthusiast, phonics is the bridge that leads directly to the wonderful land of Reading for Pleasure. As children become confident at a simple level, teach the next level of code and introduce books that contain complex code. Balance this carefully – set just the right level of challenge – to stretch children while, again, ensuring success at each step. It’s very exciting, done with conviction and passion. …they look at the lunch table – oops! – ‘I can’t believe it’s not butter’ – they’ve read it! They didn’t even want to or mean to; they just couldn’t help it because decoding has become so effortless, so slick… soooooo easy. This is true of my own four children, now aged 7-12, who learnt to read through systematic synthetic phonics at home, with me and my self-taught knowledge, a little every day. It was my son at nursery, who, at the lunch table, read with pleasure ‘I can’t believe it’s not butter’, much to the amusement of the nursery staff. My four can’t stop reading. They see print, they read it. This is a vital building block in enabling children to read for pleasure. It cannot and will not be pleasurable if it is difficult, if it is slow and if it doesn’t make sense. We mustn’t underestimate the comprehension development that has already taken place, whatever their background, not least because our time with them for all of the curriculum from Reception -Y11 will only ever total less than 25%* of their waking hours to age 16. The percentage available for schools to devote to reading is a fraction of that. Many children will arrive at school already loving or not loving – and everything in between – books. We have to work with that. With only 1235* hours to play with in their first year of school, much of which is spent at lunch, in assembly, on trips, off ill, being snowed out, in the loo, rehearsing for shows, in the playground, in PE, learning about music, having golden time, doing art, doing maths and all manner of other crucial and exciting things on the curriculum, we must be very strategic. With relatively few hours and with 30 + in a class, we must be realistic. We can’t do everything we would like and love to do for developing reading in the very precious time that we have. If we unlock print quickly, clearly and thoroughly so that children decode confidently and accurately without wasting a second on any guessing at all, they will soon not need the help or confirmation of an adult. Once they are unable to look at the cover or first page of a book without reading the print instantaneously, effortlessly and with ease, we’ll know that we have been successful in the first and most important task in encouraging them to read for pleasure. Then we can let the wonderful words, phrases and sentences on the page sing out. Let the words do the talking. Let the books sell themselves. How marvellous would it be if our children began to choose books because they were attracted to the blurb, the front page, the words in the middle as well as the engaging covers and pictures? Confident and fluent readers can take books home to read independently in the 3510* hours they’ll spend outside school in that first year of Reception and every year thereafter. We all love doing the reading with them and to them but we must ensure that we equip them early to read effortlessly to themselves if we are to nurture readers who choose to read for pleasure when we cannot be there to engage them. The wonderful and dynamic ideas for encouraging reading are varied and endless. But, while a child finds the act of reading print at all laborious, even the most marvellous strategy may fall flat because reading, which they must ultimately do alone if we want children to develop into fully fledged independent readers, is not yet pleasurable. Every time somebody attempts to change the art of teaching into the science of convenience a fairy dies. Seen any recently? There’s a lot of teeth in my house. Every time a tooth falls out, one of four fairies visits us. Each has a different name, personality and handwriting style. Each leaves a sparkly note. Each message is crafted with love and great humour but at just the right length and level for each child to decode on their own, effortlessly. No need for impish guesswork. These notes get longer with every tooth, and that’s barely noticed; they cause great excitement and are read over and over again. So many questions arise: How does a fairy carry a message? How can she hold a pen big enough to write letters that we can read? Is the ink made from berries? Often, the children write secret notes back with these questions and more, hiding them under their pillows. They are very surprised when a fairy hasn’t collected hers (or his) after two or three days. They must be very busy, we agree. …It’s as if the fairies secretly want the children to practise their decoding skills and, as if by magic, it’s nothing but pleasure. There’s definitely an art to it. And a fair bit of science. Honestly. In my school we bought every pupil and teacher a copy of the same book and did something similar. In English lessons they did some analysis and worked on reading skills, the book we chose has historical links with science and history so they also did lessons relevant to the book in those subjects. In registration and other randomly selected lessons they read the book. It was brilliant, they keep asking when we’re doing it again. We called it a whole school read and genuinely every child and nearly every teacher read the same book. David – I like your suggestions for reading literature aloud regardless of age. The trouble with DEAR is that many people (most?) may be unaware of the prevalence of pupils skipping words when reading silently either because they cannot decode them, or cannot be bothered to decode them or cannot decode them readily or automatically. Fully literate readers skip new words (the longer more challenging new words) but could decode them if they had to (that is, come up with a pronunciation) and they may have ‘skipped’ the new words simply because of laziness. They still get the gist of the text so the skipping does not alter comprehension. What skipping words prevents, however, is the uptake of new words into spoken vocabulary because there is no associated pronunciation. As you know, we have endemic guessing of words by default or as a consequence of specific (flawed) teaching strategies. My point is that DEAR may leave many children in a sea of embedding guessing and skipping words rather than taking new vocabulary on board complete with pronunciations to transfer to spoken language. So – much better to spend precious time reading aloud and engaging young people in the world of literature as you suggest – so that a good book becomes the ‘in thing’ to share. Thanks Debbie – you’re right about the role of pronunciation in vocabulary acquisition – the same is true of the ability to deconstruct and reconstruct words (i.e. spelling). This all goes to show just how important fluent decoding is even to highly skilled readers. But being able to decode English fluently doesn’t necessarily help you with spelling. It does in many cases but not in all. Yet again, where there are strong dialect deviations from r.p., (e.g. ‘f’ for ‘th’ in London) it may well end up in two-way confusions e.g. ‘dithicult’ from my son. Oh – and of course teach all pupils the alphabetic code well in the first place! Beautiful, well stocked libraries with the best up to date books would entice most children I reckon. But the reality is less alluring…tatty old books, or reading materials dictated by parents. Fab! I have ERIC time. Everyone reading in class. I used to have Indiv reading, paired reading group reading and a group listening to stories with headphones on CD. There’s also kindles now so that helps. I’d like to do it everyday but timetable restraints don’t allow this . I will try harder next term!! I’m a secondaty school English teacher in Ireland and always read the text to my classes (12-18yrs of age). This is mainly because of the various learning difficulties present but also because we all enjoy the experience. I attempted a one book one day event where various classes would spend all day reading the same book and the biggest obstacle was the staff. Their negative attitude affected the students. Maybe if I tried it iver a number of weeks this might improve. I teach in ks2 and have had some years where reading for pleasure has taken off, and others when it hasn’t. We ‘do’ guided reading, quiet reading, and we encourage the children vigorously to read at home. But the ‘take-off’ happens spontaneously. The most crucial thing I’ve done is to read to them. All children one year were reading (or having read to them) the Alex rider books; they played Alex games, formed clubs and designed gadgets. The last two years were David Walliams years. This year’s read has been the Wimpy Kid series, which I haven’t introduced, but I did provide plenty of books to borrow once I saw it taking off. They have been a pretty reluctant bunch, and I’m delighted – and they are proud that they’re reading longer books. Some are now branching out and reading other things too. I suppose it’s been a case of making reading normal and enjoyable – not forcing it, but going with the flow once it happens. Our problem is also teachers who don’t have time to read for themselves and have forgotten it is a pleasure and younger staff who haven’t read a range of ‘quality’ texts when they were at school as they went through being fed on the literacy hour so deep down they still have the urge to split all lessons into 3 parts! I have bought decent texts for each year group and then we have had to have training on how to use them effectively in class. We do class readers but again I have to stop them using it as a guided session and forcing individuals to read out loud – I was forced to read Emma and Tess of the D’Urbevilles like that at sixth form and can’t tell you how much I loathe both books as a result. Headteachers need to take the lead and show reading, allow reading, budget for reading and very actively encourage it every day – have just got all the staff a book voucher as an end of year pressure instead of another bottle of wine and we will display their book choices on the Autumn – fingers crossed I have no shades of grey fans!!! My kid’s English teacher set him a challenge to read Treasure Island at home this year, because she could see that he really enjoys reading outside of school and she wanted him to try something with vocabulary he might find tricky. This is not a comment on your blog, I just thought it was interesting that you mentioned this text as a challenging one. He’s in Year 7. When I see that ‘read for 20 mins’ stat, I always think ‘is that all?’ My kids regularly read for an hour or more of an evening. Again not a comment on your blog, just a thought about where we set our expectations. He keeps defaulting to the other books he’s got in his ‘to read’ pile at the moment. I might sit down and read it with him over the summer though as I’d love to revisit it. I have a very happy memory of being taken to see the play of the book as a child. So many things here resonate, not least your comment about boredom and few other alternative attractions resulting in a childhood where many hours were spent reading! I am, and always have been, an avid reader who consumes books, papers, blogs etc. at every possible opportunity, including when I should be doing something else! My own children can all read well and are successful young adults but none of them choose to read other than occasionally on holiday. They are all far more active than me, and as a result probably healthier, but that’s another issue…… However, they all have wide and rich vocabularies, are able to express themselves well and have been successful in their educational achievements. My theory is that we read to them daily as young children and as a family we have always spent time talking things through, asking for and listening to their opinions and thoughts and supported them in developing the vocabulary to do this, which has perhaps compensated. However, many children do not have these advantages. Having worked as a teacher and a SENCO in both primary and secondary schools, I have observed a significant number of children who find school difficult many of whom have struggled to regulate their behaviour within the classroom. Without fail the one thing all these young people were able to access and enjoy was a good story being read to them. They invariably engaged in discussions about the story and frequently asked great questions demonstrating a good understanding. Often they were the first to be ready for the story. Many were also increasingly motivated to work hard to develop their own reading skills, something they found extremely difficult. Anecdotal rather than scientific I know, but I instinctively think there’s something here that’s worth exploring further. I think sometimes we assume in secondary that all our students have the necessary vocabulary and relevant experiences to draw on to support their learning. Sadly this is often not the case. Everyone hearing the same good read over a period of time can only provide opportunities for language development; both through hearing the story and as a result of the discussions that I suspect would begin to take place. This is something I’ll certainly be looking to promote in my current school. A thought provoking post – as ever. Thanks for this. I pitched the idea of DEAL – time today and the curriculum deputy has given the green light to 20 mins a day (rotating so not to hit same subjects) for a fortnight 3 times a year, initially with Years 7 and 8. The kids ‘literacy steering group’ have suggested teachers read either Horowitz’s version of Greek myths or Sherlock Holmes. Any thoughts on a) text choices and b) measuring impact? Either of those text choices sound fine. Measuring impact is impossible though. How can you really know the effect? What you could try is to give a vocab test before and after the test but I wouldn’t be confident that this will have much impact over such short time scales. Alternatively you could simply try surveying students about how much they enjoyed the experience. Thanks. With regard to impact, I think I will content myself with finding out how many enjoy it and think we should do it again. I will ‘report back’ on the experience at a later date. Children should be allowed to read anything for pleasure not just fiction books. Magazines, non-fiction books, instructions on computer games such Age of Empires etc. I think it is a shame that anything other than fiction is so often ‘looked down upon’ by those who should be encouraging reading. Of course children should allowed and encouraged to read everything and anything. But we should only spend curriculum time on high quality texts. I disagree entirely. Arguably a ‘quality text’ is any text people love to read – most certainly any text that inspires reluctant readers to read. The ‘we know best’ attitude is half the problem. There is of course value to understanding shared culture, heritage etc. But that is additional, albeit possibly complementary to the challenge of inspiring a love of reading. I think it’s a great shame that libraries, book shops and classrooms are filled with the same ‘quality texts’ determined by the biggest publishers with the biggest marketing budgets. Better in my opinion for teachers to use the texts and subjects they love themselves, and then encourage the same by those they inspire. Nothing inspires more than somebody genuinely passionate about their subject. At what stage does a story become a quality text? ‘The book Whisperer’ by Donalyn Miller is certainly worth a read as it addresses many of these issues. I thought most of the English language exam was based on non-fiction texts so why not allow children to read sports’ reports or popular science books by people they have seen on TV for example. As a school librarian, I have loved reading aloud to class groups that found it difficult or near impossible to settle into silent reading. I recall reading the Telltale Heart to one group of year 7s who paid good attention and really seemed to enjoy it. On the other hand, I have also tried and failed to capture the attention of class groups with recordings of children’s literature or podcasts. Could the success of reading aloud – the missing ingredient that it provides – be due to the fact that it is a personal and interactive experience that mimics parent-child intimacy? I think it’s hugely valuable, but I don’t feel it can replace the skills of concentration, application and focus that are required for independent reading. As the summer term came to an end and lessons were continually disrupted by summer events I gave up and began reading ‘Deepwood’ to Yr7, 8 and 9. I asked them to doodle as I read as long as it had something to do with what they heard. They all loved it. One class actually applauded at the end of one session! Their drawings were full of creativity and showed connection to the reading. I think the majority of us really enjoyed the experience. We are about to launch Accelerated Reader and have SLT support for D.E.A.R time, (20 mins a day). My biggest concern are the reluctant and lower ability students and how to support them in this process. I think giving teachers the option of reading aloud during D.E.A.R time may be a good option. Some great thoughts here. I have ages6/7 in my class. I read aloud at least 4 times a week. Pupils are more likely, in my opinion, to then choose that same book from the library and read it themselves. I agree. How many children don’t like reading as a result of never having been read to, I suspect it’s a significant percentage. Although, it seems some people don’t like fiction and make believe as they find it hard to suspend belief. I would like to do this with my form group. Also, it sets an example. One benefit of an older text like treasure island is students could buy their own copy quite cheaply if they want to read along. My form group is 11-16 so it would have to span the ages but keep them interested. When I was in year 6 my headteacher in year 6 read us A Tale of Two Cities which we were far too young for (I was a very strong reader at this age and had a wide political awareness for an 11 year old but it was too dry) and put me off Dickens to date. Nevertheless it still felt special that he took the time to read to us and he was good at it, but not as good as my Mum! She used to do a Winnie the Pooh assembly in secondary assemblies with voices and it was loved by all ages about giving and receiving graciously I would be quite tempted to start with an autobiography if not that well written. I think a lot of my students would enjoyFabrice Mwambe’s autobiography. Although it is while since I have read it so I would have to check its age appropriate. I like Ishmael Beah’s autobiography but it may be just too harrowing for younger students. DEAR (out loud) seems like a great opportunity to drop in some of what Debbie calls ‘incidental phonics’, picking out a couple of those longer words and/or more unusual spellings. I’m a phonics tutor for struggling readers and use this often to help children (incl my own) pay attention to the construction and spelling of more difficult words. You do have to have a really sound grasp of phonics though, or you’ll tie yourself up in knots with spellings and impossible spelling ‘rules’! My son’s secondary school do DEAR and the sessions he seems to remember are the ones where a teacher is enthused about a book they are reading and shares it with the class. As he is a reluctant and formally ‘dyslexic’ reader, it’s lovely to hear him enjoy someone else’s passion. I still read to him at night, age 12, and have just finished ‘Grinny’ by Nicholas Fisk, old but “really excellent” he said. I have used a reading scheme that was differentiated for reluctant and weak readers with a fun activity at the end to measure understanding. This helps gauge which books to give which readers with a certificate given for completing each level. I got a year 9 not from an F to a D in a matter of months. It’s about having a range of genres and matching the child to a genre they enjoy. Let me know if you want more information. Hi Liz, I would love to learn more about your differentiated reading scheme. We have a three year KS4 and I am looking at finding ways to target the weaker and more reluctant readers to boost their skills at the start. Really enjoyed reading this article – those are some powerful statistics and worth, I think, sharing with pupils so that they can see some of the additional benefits of ‘reading for pleasure’. I am currently enjoying some success with getting year 8 to read for pleasure. We have a library lesson each week. Every week I read the first chapter (or few pages, depending on length) of a new book to them. The selected books always come from class sets. They then can borrow the book to finish it that week, if they are interested. The class seem to love this approach and are always eager to borrow the book and return it by the following week. Since September, I’d say the average student in that class has read about 8 books, which I am really pleased with. I really think being read to makes all the difference. Thanks, as ever, for sharing your thoughts. David I’ve read some things recently about schools scrapping homework and setting an expectation for pupils to read for 25 minutes each night instead. Have you come across any approaches like this in the secondary sector?